Celiac disease (gluten sensitive enteropathy) is a common disorder affecting both children and adults. As many people with celiac disease do not present with the classic malabsorptive syndrome, delays in diagnosis are common. Dental enamel defects and recurrent aphthous ulcers, which may occur in patients with celiac disease, may be the only manifestation of this disorder. When dentists encounter these features, they should enquire about other clinical symptoms, associated disorders and family history of celiac disease. In suspected cases, the patient or family physician should be advised to obtain serologic screening for celiac disease and, if positive, confirmation of the diagnosis by intestinal biopsy. Dentists can play an important role in identifying people who may have unrecognized celiac disease. Appropriate referral and a timely diagnosis can help prevent serious complications of this disorder. Celiac disease is a permanent intolerance to gluten (a protein present in wheat, rye and barley) that results in damage to the small intestinal mucosa caused by an autoimmune mechanism in those who are genetically susceptible to the disease. The villous atrophy that ensues can lead to malabsorption of a variety of macro- and micronutrients including iron, calcium, folate and fat-soluble vitamins. Celiac disease was thought to be a rare malabsorptive disorder of infancy and childhood; however, it is now considered to be a common, chronic, multi-system disorder that can present at any age when gluten is present in the diet. Celiac disease is one of the most common chronic gastrointestinal disorders in the world. Population-based serologic studies estimate that 1% of North Americans may have it, and about 90% of these cases remain undiagnosed.1-3 Celiac disease is a “clinical chameleon.” Typical symptoms are abdominal pain, diarrhea and weight loss. However, many people present with non-gastrointestinal (atypical) symptoms including anemia, extreme weakness, short stature, osteoporosis, menstrual irregularities and infertility. Additional symptoms in children include delayed growth and puberty, vomiting and dental enamel defects. Dermatitis herpetiformis is “celiac disease of the skin.” It presents with a chronic, severely itchy, blistering rash that is poorly responsive to conventional therapies. A skin biopsy helps confirm the diagnosis of dermatitis herpetiformis; as with celiac disease, the treatment includes a gluten-free diet. Celiac disease is hereditary. Both first- and second-degree relatives of the patient have a significant (5%–15%) risk of developing the disorder. Other high-risk groups include patients with autoimmune disorders, e.g., type 1 diabetes mellitus, thyroiditis and Down syndrome. Serologic screening is recommended for all those at high risk for celiac disease. Highly sensitive and specific serologic tests are available to screen for celiac disease.2,3 Those currently recommended are the serum immunoglobulin A (IgA) tissue transglutaminase (TTG) antibody test and the IgA-endomysial antibody (EMA) test. These tests have a sensitivity and specificity greater than 90%. The TTG antibody test is currently the test of choice and is widely available. IgA deficiency is common in celiac disease and, hence, total serum IgA level must also be measured to avoid a false-negative result. These serologic tests are less reliable in children under 3 years of age. Also, a negative test does not rule out celiac disease. Patients with a positive TTG antibody test should be referred for an endoscopic small intestine biopsy for confirmation of the diagnosis. Celiac disease can be effectively treated by strict, life-long adherence to a gluten-free diet. However, a gluten-free diet should not be started before a biopsy is done, as the diet will heal intestinal lesions, thus affecting interpretation of the biopsy and making confirmation of the diagnosis difficult. Awareness of celiac disease among health professionals remains poor, and delays in diagnosis are common. In Canada, the mean duration of symptoms before diagnosis in adults is 11.7 years.4,5 Serologic screening of minimally symptomatic patients or those with atypical/non-gastrointestinal complaints can significantly increase the rate of diagnosis.6 Delays in diagnosis can lead to a variety of complications, including nutritional deficiencies, such as anemia and osteoporosis, reproductive disorders, increased risk of developing other autoimmune disorders and intestinal lymphoma. The purpose of this review is to highlight the common oral manifestations of celiac disease and to provide practising dentists with clinical guidelines for managing patients suspected of having this disorder. Enamel defects include pitting, grooving and sometimes complete loss of enamel. A classification of these defects in celiac disease was developed by Aine and colleagues7 (Table 1). The various grades of defects are illustrated in Figs. 1, 2 and 3. The prevalence of dental caries in children with celiac disease varies. It was found to be no different than the general population in 1 study8 but higher in another.11 However, in both these studies, dental enamel defects were more common in patients with celiac disease compared with controls. Figure 1: Grade I enamel defects: multiple white and cream opacities with clearly defined margins. Figure 2: Grade II enamel defects: rough enamel surface with patchy symmetric opacities and discolouration. Figure 3: Grade III enamel defects: deep horizontal grooves with large pits and linear discolouration. Figure 4: Aphthous ulcers in the buccal mucosa. As enamel defects can be seen in several disorders, other possible etiologic factors should be considered before celiac disease can be firmly established as the principle cause (Table 2). The dentist can readily determine whether an etiologic factor is systemic, affecting all teeth developing at the same time (e.g., the anterior incisors and the first molars), or local, affecting only 1 or 2 teeth. Enamel hypoplasia is easily identified, as parts or all of the enamel can be poorly formed or missing altogether (Table 2, rows A, C). Localized enamel hypoplasia can take the form of pitting, grooves or deep lines across the facial surfaces, which can be normally mineralized (shiny and hard). An intact, smooth enamel surface with opaque white or yellow spots or lines indicates a less-severe hypocalcified disturbance. Dental fluorosis (Table 2, row B) is a common enamel defect.18 Amelogenesis imperfecta (Table 2, row C) is a relatively rare disorder, usually characterized by enamel pitting but sometimes appearing as hypocalcification.19 When some enamel appears to be normal, a history of vitamin D deficiency,16 severe infections or prematurity20 should be explored. 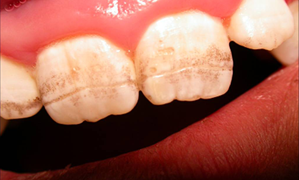 When the child recovers from these systemic problems, enamel formation returns to normal. The mouth is considered to be the doorway to the gut. Physicians may examine the oral cavity of patients as part of the physical examination, but they seldom assess the teeth. Also, they may not be trained to recognize dental abnormalities. Therefore, family dentists and dental hygienists can play an important role in identifying patients who should be screened for celiac disease. The following tips may be of help to dentists encountering oral symptoms and signs in a patient. Consider celiac disease as a possible diagnosis in any patient with dental enamel defects, recurrent oral aphthous ulcers or both. Question about other clinical symptoms of celiac disease, including abdominal pain, diarrhea, weight loss, poor growth, anemia and extreme fatigue. Remember that absence of these symptoms does not rule out celiac disease. Inquire about the presence of other autoimmune diseases, especially type 1 diabetes and thyroiditis. The presence of these will further increase the probability of celiac disease. Consider adding celiac disease to the list of disorders that you inquire about during family history screening. Having a first- or second-degree relative with celiac disease increases the likelihood of a positive diagnosis. If celiac disease is suspected, the dentist or dental hygienist may wish to coordinate laboratory testing with the patient’s primary care physician or specialist. The currently recommended screening test for celiac disease is serum IgA-TTG antibody test, which is readily available. The TTG is an IgA-based test and IgA deficiency is common in celiac disease. Therefore, total IgA level should also be measured. Do not recommend a gluten-free diet to a patient suspected of having celiac disease without confirmation of the diagnosis. In summary, dentists should be aware that enamel defects and recurrent aphthous ulcers are common manifestations of celiac disease. Increased awareness of this disorder, along with careful questioning about other symptoms, family history, serologic screening tests and appropriate referral can help establish a timely diagnosis and prevent complications of untreated celiac disease. The diagnosis of celiac disease can sometimes be made from a smile! Ms. Zarkada is a member of the professional advisory board, Canadian Celiac Association, Mississauga, Ontario. Ms. Anca is a member of the professional advisory board, Canadian Celiac Association, Mississauga, Ontario. Dr. Limeback is professor and head of preventive dentistry, faculty of dentistry, University of Toronto, Toronto, Ontario. Acknowledgements: The authors thank Dr. Ted Malahias, New York Medical College, and Dr. Peter Green, Columbia University College of Physicians and Surgeons, for providing the photos used in Figures 1 and 2. We thank the Children’s Digestive Health and Nutrition Foundation and the North American Society for Pediatric Gastroenterology, Hepatology and Nutrition for use of the photos in Figures 3 and 4, which are from its Celiac Disease: Evaluation and Management slide set. We also acknowledge Dr. Gordon Nikiforuk for providing the photos in rows A, B and D of Table 2. Correspondence to: Dr. Mohsin Rashid, Division of gastroenterology and nutrition, Department of pediatrics, Dalhousie University, IWK Health Centre, Halifax NS B3K 6R8. National Institutes of Health consensus development conference statement on celiac disease, June 28–30, 2004. Gastroenterology. 2005;128(4 Suppl 1):S1-9. Hill I, Dirks M, Liptak GS, Colletti RB, Fasano A, Guandalini S, et al. Guideline for the diagnosis and treatment of celiac disease in children: recommendations of the North American Society for Pediatric Gastroenterology, Hepatology and Nutrition. J Pediatr Gastroenterol Nutr. 2005;40(1):1-19. AGA Institute. AGA Institute medical position statement on the diagnosis and management of celiac disease. Gastroenterology. 2006;131(6):1977-80. Cranney A, Zarkadas M, Graham ID, Butzner JD, Rashid M, Warren R, et al. The Canadian Celiac Health Survey. Dig Dis Sci. 2007;52(4):1087-95. Epub 2007 Feb 22. Rashid M, Cranney A, Zarkadas M, Graham ID, Switzer C, Case S, et al. Celiac disease: evaluation of the diagnosis and dietary compliance in Canadian children. Pediatrics. 2005;116(6):e754-9. Catassi C, Kryszak D, Louis-Jacques O, Duerksen DR, Hill I, Crowe SE, et al. Detection of celiac disease in primary care: a multicenter case-finding study in North America. Am J Gastroenterol. 2007;102(7):1454-60. Epub 2007 Mar 13. Aine L, Mäki M, Collin P, Keyriläinen O. Dental enamel defects in celiac disease. J Oral Pathol Med. 1990;19(6):241-5. Priovolou CH, Vanderas AP, Papagiannoulis L.A comparative study on the prevalence of enamel defects and dental caries in children and adolescents with and without coeliac disease. Eur J Paediatr Dent. 2004;5(2):102-6. Bucci P, Carile F, Sangianantoni A, D’Angiò F, Santarelli A, Lo Muzio L. Oral aphthous ulcers and dental enamel defects in children with coeliac disease. Acta Paediatr. 2006;95(2):203-7. Campisi G, Di Liberto, Iacono G, Compilato D, Di Prima L, Calvino F, et al. Oral pathology in untreated coeliac disease. Aliment Pharmacol Ther. 2007;26(11-12):1529-36. Epub 2007 Oct 5. Avsar A, Kalayci AG. The presence and distribution of dental enamel defects and caries in children with celiac disease. Turk J Pediatr. 2008;50(1):45-50. Shakeri R, Zamani F, Sotoudehmanesh R, Amiri A, Mohamadnejad M, Davatchi F, et al. Gluten sensitivity enteropathy in patients with recurrent aphthous stomatitis. BMC Gastroenterol. 2009;9:44. Cheng J, Malahias T, Brar P, Minaya MT, Green PH. The association between celiac disease, dental enamel defects, and aphthous ulcers in a United States cohort. J Clin Gastroenterol. 2010:44(3):191-4. Pastore L, Carroccio A, Compilato D, Panzarella V, Serpico R, Lo Muzio L. Oral manifestations of celiac disease. J Clin Gastroenterol. 2008;42(3):224-32. Pastore L, Campisi G, Compilato D, Lo Muzio L. Orally based diagnosis of celiac disease: current perspectives. J Dent Res. 2008;87(12):1100-7. Fraser D, Nikiforuk G. The etiology of enamel hypoplasia in children — a unifying concept. J Int Assoc Dent Child. 1982;13(1):1-11. Mäki M, Aine L, Lipsanen V, Koskimies S. Dental enamel defects in first-degree relatives of coeliac disease patients. Lancet. 1991;337(8744):763-4. Vieira A, Lawrence H, Limeback H, Sampaio F, Grynpas M. A visual analog scale for measuring dental fluorosis severity. J Am Dent Assoc. 2005;136(7):895-901. Kim JW, Simmer JP, Lin BP, Seymen F, Bartlett JD, Hu JC. Mutational analysis of candidate genes in 24 amelogenesis imperfecta families. Eur J Oral Sci. 2006;114 (Suppl 1):3-12. Hall RK. Prevalence of developmental defects of tooth enamel (DDE) in a pediatric hospital department of dentistry population (1). Adv Dent Res. 1989;3(2):114-9.